INTPs are complex thinkers that love the world of possibilities and ideas. They are quietly studious yet open-minded, always looking to expand their knowledge of their favorite subjects. They want to improve and innovate, problem solve and come up with logical theories. They are fascinated by intense, often existential questions. INTPs are a rare breed, making up roughly 2.5% of the population. They are known for being intellectual, curious, and logical. INFJs are intellectual and empathic. They live in the world of hidden meanings and symbols. They are constantly trying to determine underlying patterns and meanings that will lead to a future outcome. They have intense insights into people and are highly independent yet intensely devoted to the ones they love. The INFJ is also a rare breed, making up only 1% of the population. They are known for their integrity, thoughtfulness, and insight. 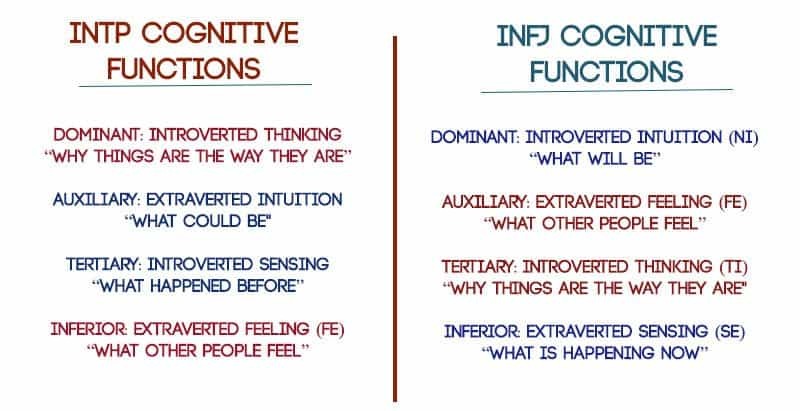 If you look at the chart below you can see that INFJs and INTPs share two cognitive functions. Both use introverted thinking as their logical sorting process, and both use extraverted feeling to understand and “read” other people. Aside from that they share the same preferences for introversion and intuition, although the INTP uses Ne (Extraverted Intuition) while the INFJ uses Ni (Introverted Intuition). Both INTPs and INFJs will pair their thinking with their intuitive process to try to understand complex “why” questions. They are both fascinated by the existential and will use their intuition and thinking to try to understand the meaning of life or the purpose behind everything. There are no questions that either type could have that the other one wouldn’t be open to discussing and pondering. Together these two can explore endless possibilities and unlock new discoveries and insights, each one spurring the other on towards a deeper and more holistic vision. INTPs and INFJs both share a preference for introversion. These two types can enjoy curling up with a good book in a quiet room and feel completely energized by the experience. Neither one is likely to push the other into social settings they aren’t ready for, and both will understand and respect the other’s need for time alone and space. INFJs and INTPs also share a similar feeling of being outsiders in the world. Because together they make up only 3.5% of the population, they have often been misunderstood or forced into a mold that was unnatural for them. Together they feel like they can be themselves and that they are accepted for who they are. They can feel like two misfit “peas in a pod” and find comfort and solace in each other. INTPs and INFJs share the same feeling and thinking functions, but in a different order. This can be a positive thing that causes an instant connection between the two. INTPs have inferior Fe and as a result are often attracted to the warmth of the INFJs auxiliary Fe. In turn, INFJs who have tertiary Ti are attracted to the depth and knowledge of the INTPs dominant Ti. Both types will feel that the other provides a balance and completeness to their lives. They can also help each other grow and develop in the ways that are more unconscious for them. The INTP can help the INFJ have more conscious control over Ti and the INFJ can help the INTP have more conscious control over Fe. INFJs and INTPs also tend to have an offbeat sense of humor, and when they’re together they can be as quirky as they want to be without feeling judged. They appreciate and admire each other’s unique ways of viewing the world and are intrigued by each other’s insights. The main struggles that these couples face have to do with the thinking/feeling difference. INTPs are extremely private individuals who believe that their love is self-evident by their actions or decision to be in the relationship. 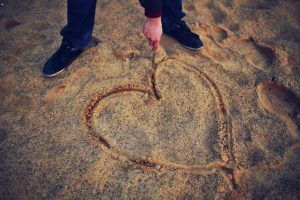 INFJs, in contrast, like to show their love frequently through actions and words and like to have regular reassurance of their partner’s feelings. Also, INTPs tend to be very unemotional and contained about their feelings and this can make the INFJ feel insecure or lonely because they like to have a regular exchange of feelings and an openness with their partner. INTPs, in turn, can feel that their INFJ partners are too emotional and too focused on their feelings. While the INFJ strives more and more to maintain harmony and open emotional communication, the INTP may pull back more and more trying to regain autonomy and space. Another common thinking/feeling problem in this pairing stems from the INTPs tendency to be “stuck” in his or her head. INFJs have this same propensity, but they are also hyper-aware of the people in their environment, due to auxiliary Fe. As a result, the INTP may be unaware of problems that are brewing, or if they have unintentionally offended the INFJ. INTPs have a hard time understanding or picking up on the emotions of others, whereas INFJs are extremely aware of this. INFJs tend to hold in their feelings and ignore them until they reach a breaking point, and then they may lose their temper and “blow up”. This can catch the INTP off guard and cause them to retreat even further from the relationship, and can leave the INFJ feeling even more helpless and frustrated than before. The other struggle that these couples face has to do with the judging/perceiving preference. INTPs prefer to keep plans open-ended whereas INFJs prefer closure. INTPs like to have a sort of “organized chaos” in their surroundings, and INFJs are more likely to keep things neat and organized. The INFJ may feel frustrated by the INTPs spontaneity and unwillingness to settle on a “plan” and the INTP may feel nagged or pressured to settle on a decision before he or she has all the information they want to move forward. Both the INFJ and the INTP dislike dealing with routine, day-to-day tasks, but the INTP is more content to live with a little messiness while the INFJ is much less comfortable doing so. 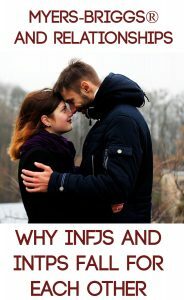 As a result the INFJ can wind up resenting their INTP partner who leaves more of the mundane, routine activities by the wayside, inadvertently causing the INFJ to “pick up the slack”. The INTP, in turn, can feel pressured by the INFJ to spend more time attending to practical routine matters than they’d like. It’s important to remember that there are variations within type, and not all INTPs are going to be prone to messiness and not all INFJs are going to be “neat”. This just tends to be a common struggle in these relationship pairings. – Understand that your partner needs a great deal of privacy and independence. – Approach problems directly and calmly. Try not to let frustrations simmer under the surface only to blow up later. Be as honest as possible and give the INTP time to think and give an answer or explain his side of the story. – Try not to make comparisons about how much work you are doing versus how much work your partner is doing. If you want help with practical matters bring it up in an understanding, calm way. – Show appreciation for your partner’s accomplishments, intellect, and abilities. – Try to be open to spontaneous decisions and be willing to give your partner plenty of time to make a decision. Try not to push them into a decision before they are ready. – Try to understand that your partner is rarely mean-spirited, but may be tactless or unintentionally insensitive. When you are offended, try to bring it up to them in a very calm, understanding way. NOTE: It’s important that both partners try to work at understanding their partner and meeting their needs. If only one partner is trying to understand the other, this can over time lead to resentment and frustration for the partner putting in all the effort. – Try to share your feelings and personal reactions whenever you feel comfortable. Understand that your partner will want more verbal affirmation than you do. – Give your partner your undivided attention when they are speaking to you. Show appreciation for their empathy and warmth. – Try to involve your partner in your projects and interests. Ask for their insights and opinions and be open to discussion. – Don’t dismiss your partner’s feelings or be condescending about their emotions. Never refer to their emotions, values, and feelings as “illogical”. – Try to share the burden of housework and other practical matters so that you both are doing an equal amount. – Follow through on your commitments and try to be on-time to dates and scheduled outings. Understand that your partner will want closure more than you will and try to give them closure on decisions as soon as you possibly feel ready. Is this post helpful? What are your experiences with the INFJ/INTP pairing. Feel free to share in the comments! You can also get WAY more information in my new eBook, The INFJ – Understanding the Mystic.